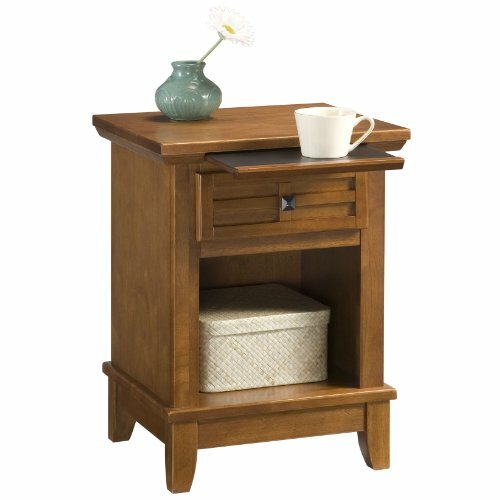 Elizabeth The nightstand looks pretty much as pictured, and the slide-out tray is handy. The drawer is pretty shallow -- more than is pictured -- so it won't hold much. The opening is good for stacking books or, as pictured, some sort of basket or decorative container. A better idea would have been for the manufacturer to offer an option with a hinged door there. I also would have liked the top to be solid wood, rather than the veneer. But for the price (we got it on sale and got free shipping), it's a good value. Sandra We were looking for a smaller nightstand to give us more room in our bedroom. This fit perfectly. It was easy to assemble and we purchased a basket for the open space to hold items without clutter. The finish matched perfectly with our oak bedroom set. The customer service we received was excellent. Drguz This item is a very reasonable bedside table. I liked the way it was built and it is attractive. Buy this item without reservation. You will be pleased with the way it looks and the equality of the unit when assembled.